For some people positive reinforcement is the absolute best way to inspire them to move forward and accomplish even better goals. This type of reinforcement affects everyone differently and has different levels of importance for each person. 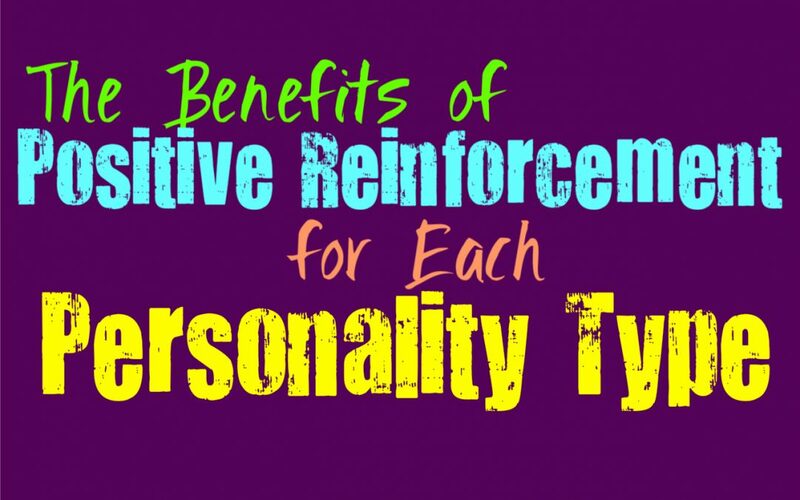 Here is how positive reinforcement benefits you, based on your personality type. INFJs really need positive reinforcement from their loved ones, or else they can feel like their efforts are pointless. They really thrive when they feel a sense of positive reinforcement from the people they care for, since these are the ones who matter most to them. When the INFJ experiences this type of positivity, it helps them to feel inspired and really pushes them to be even better. Negativity rarely works effectively for the INFJ, and leaves them feeling more like giving up than anything else. They not only thrive with positive reinforcement, in a lot of ways they need it. This is something INFJs won’t openly show to others, and in most situations people don’t recognize how important it is for them. ENFJs really do thrive when they receive positive reinforcement, and without it they eventually become drained. They do a lot for those around them and work hard to make others happy, and so they really do need to hear that they are doing a good job. ENFJs do so much for others, but they need to feel some sort of reward and appreciation or else they feel drained. When the ENFJ does receive positive reinforcement from someone they care for, it gives them an even stronger sense of drive and inspiration. This is the most rewarding thing for the ENFJ, but that doesn’t mean negativity doesn’t also give them a drive to push forward. For the ENFJ they need positivity from their loved ones, and respond to negativity from their enemies by being competitive. INFPs can really wilt and crumble when they receive constant negativity from those around them. They a susceptible to these surrounding emotions and it can leave them feeling truly drained and unable to push forward. They really do need to feel some sort of positive reinforcement when it comes to their loved ones, and negativity isn’t something which will push them forward. INFPs do better when they are around people who are willing to give them some sort of positive reinforcement for their efforts and the capabilities they do have. While ENFPs can sometimes put on a bravado around others, but that doesn’t mean they don’t have strong sensitivities inside of them. The ENFP might put on a confident attitude, but they really do need positive reinforcement to keep moving forward. They might pretend like negativity doesn’t bother them, but deep down it sincerely does. They want to feel positivity and pride from their loved ones, or else they won’t really feel like doing much of anything. Without this positive reinforcement from their loved ones, ENFPs can sometimes crumble and stop really caring about things that matter. INTJs don’t really require positive reinforcement as much as some personality types might. For them negativity from their enemies can actually push them to be more competitive and strive to beat those people. INTJs are strong-willed people who do whatever it takes to achieve their goals and get things done efficiently. When it comes to positive reinforcement, it is only useful if they know it comes from a place of sincerity and not just trying to make them feel good. When it comes from people they respect and trust, this will definitely be inspiring and rewarding for the INTJ. ENTJs work hard to get things done and achieve their goals, and so for them positive reinforcement actually is something they need. When it comes to receiving negativity, this is only useful for the ENTJ if it comes from their enemies. When people they aren’t connected to put them down, the ENTJ will immediately take this as a challenge and a way to prove them wrong. They do however, want to feel a sense of positivity and reward from the people they love and trust. When someone the ENTJ respects gives them positive reinforcement, it really inspires them to keep moving forward and make those people proud. INTPs often appear rather hard and even a bit cold on the outside, but that isn’t necessarily representative of who they are. INTPs actually do need to receive positive reinforcement from the people they love and respect, but for them it needs to feel sincere. INTPs can often feel like any positivity reinforcement or compliments, feel a bit fake and like they aren’t coming from a place of honesty and openness. They can have a hard time trusting it and might overanalyze, which can leave the INTP having doubts. If they do believe the positive reinforcement is sincere, then it will certainly leave them feeling rewarded and strengthened. ENTPs won’t make it obvious that they are rewarding by positive reinforcement, since they tend to seem rather independent. They don’t appear as caring and sensitive as they truly are, especially when it comes to their loved ones. When the ENTP receives positive reinforcement from people they trust and respect, it definitely inspires them to keep moving forward and work towards accomplishing even greater goals in life. While ENTPs do feel rewarded by positive reinforcement, they can also feel a bit competitive towards people who give them negative reinforcement. ISTJs really need positive reinforcement as a gauge of their efforts and how well they are actually doing. For the ISTJ it is more about knowing that they are being recognized and that their hard work is paying off in a way that others can really see. They also need to receive some sort of positive feedback from their boss, since their career and being able to do things well is vital for them. While ISTJs might not express a need for positive reinforcement, it is simply something that helps them move forward and realize where they are at in their lives. ESTJs respond to both positive and negative reinforcement depending on who it is coming from. When the people they aren’t close to and don’t care for give them some sort of negativity, it often serves to propel the ESTJ forward. They take this negative reinforcement as inspiration to be even more competitive and prove those people wrong. ESTJs do however, need positive reinforcement from their loved ones, and feel truly rewarded when the people they love show them how much they appreciate the ESTJs efforts and success. ISFJs really do need positive reinforcement, especially since they work so hard and do so much for others. They are compassionate people who really want to provide for and take care of others. This sense of consideration for the well-being of their loved ones, is a major reason why the ISFJ really does need positive reinforcement. Without this positivity from the people around them, the ISFJ can start to feel like they are either failing or simply aren’t appreciated enough. ESFJs might not express this openly, but they don’t just thrive from positive reinforcement they actually require it. Without feeling a sense of positivity from their loved ones, it becomes hard for the ESFJ to continue and move forward. Without knowing that their hard work and constant efforts are appreciated, they might struggle to feel inspired to really continue working so hard. They need to feel close to their loved ones, and need the sense of appreciation in order to really do this. ISTPs don’t necessarily require constant positive reinforcement in order to feel inspired. They often decide things on their own terms and don’t like feeling like they need to rely on others for this. ISTPs believe it is important to trust their own instincts instead constantly trying to trust what others think of them. While they do feel rewarded from positive reinforcement that comes from those they respect and trust, they don’t need it from everyone they encounter. ESTPs can sometimes appear truly confident and this makes it seem like they don’t need positive reinforcement. They are logical people who approach things from a more factual point of view. Their sometimes hard exterior can hide the fact that ESTPs actually do need positive reinforcement in order to move forward. Not only do ESTPs want this positivity from their loved ones, but they really need it from their boss and career as well. Without hearing some sort of positivity they can start to falter and feel like they need to explore different options. ISFPs really do crave positive reinforcement from their loved ones, but even from people they aren’t close to. Hearing positive feedback really helps the ISFP feel inspired to keep trying harder and pushes them to move forward. If they don’t really feel this sense of positivity it can be truly detrimental for the ISFP and leave them feeling drained. They often gauge their own worth internally, but without hearing positive reinforcement from their loved ones they can start to doubt this. For the ESFP positive reinforcement is something they really need in order to feel happy with themselves and their lives. They need to feel a sense of positivity from their loved ones, or else they become depressed and drained. ESFPs need people who appreciate them and recognize all of the things they do and are capable of. They are caring people, but sometimes their fun-loving attitudes can hide their sensitivities. ESFPs really do need positive reinforcement like the air they breathe, especially from the people they love.